Dr. Jentsch received her B.A. (Spanish major/French minor) from Kutztown State College (PA), where she also studied Russian. She received her M.A. In Spanish and her Ph.D in Spanish and Portuguese from Vanderbilt University. She serves as Program Director for Spanish and teaches courses on all levels, including Medical Spanish and the senior capstone course. Her area of interest is 20th century Peninsular and Latin American poetry. She has translated and published several poems by the Peruvian poet, Carlos Orihuela. Dr. Jentsch serves as the faculty advisor for Sigma Delta Pi Spanish Honor Society and for Spanish Language and Literature first majors. 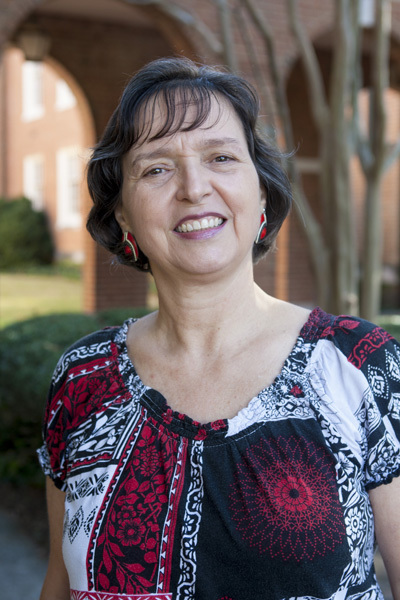 She is the co-director of Samford's interdisciplinary Latin American Studies Program and has designed and taught the entry-level course for the major and minor as well as the senior capstone course for the LAST major. She also serves as the evaluator for written and oral final exams for PORT 101-202 (offered through Samford’s Critical Languages Program) and has taught Portuguese on the 300 level. She has traveled widely in Europe and Latin America and serves regularly as Professor-in-Residence in Samford's study abroad programs in Spain and Costa Rica.